You can win 2 free tickets to The Pink Panther Strikes Again! Many of you may have seen the Pink Panther series of films, but this is the first time you'll have seen one on stage. The bumbling French police inspector Clouseau, his increasingly lunatic former Chief Inspector Dreyfus, and not forgetting the unpredictable manservant Cato, they're all here. "A variety of other characters, played by 15 actors, keep this fast-paced comedy rolling along at a breakneck speed." Tickets for this show will be on sale soon, but here's a chance for you to win two tickets to the opening night on the 15th August 2019, at the Arches Open Air Theatre in Clifton Reynes, just outside Olney. We are offering two tickets for you, plus a complimentary bottle of Prosecco if you can name the original actor who portrayed Chief Inspector Charles Dreyfus. Just email me directly with his name and you will be put into a hat and it will be pulled out next month with the winner being announced on my blog, and directly to the winner of course. Happy researching (if you need to), but he was extremely well known. David is the owner of David Pibworth Productions (DPP) which provide corporate entertainment and also actors for corporate training and development. Having worked in the Light Entertainment field for many years and produced shows for Al Murray & Joe Pasquale amongst others, David is in a position to advise on well-known comedy and musical acts. DPP also represent Ray Galton and Alan Simpson's scripts which include Hancock's Half Hour and Steptoe and Son. He is the director of MK Theatre of Comedy who are very well known locally for their stage adaptations of classic comedy scripts such as Fawlty Towers, The Vicar of Dibley, Allo Allo and many others. He is a long-standing member of Equity and the Directors Guild of Great Britain and has acted in, and directed, many productions over the years, mainly in Light Entertainment, but with occasional forays into Shakespeare etc. Every Christmas he is contracted as an Ugly Sister in Cinderella, currently with 'That's Entertainment' who also use him as a director. 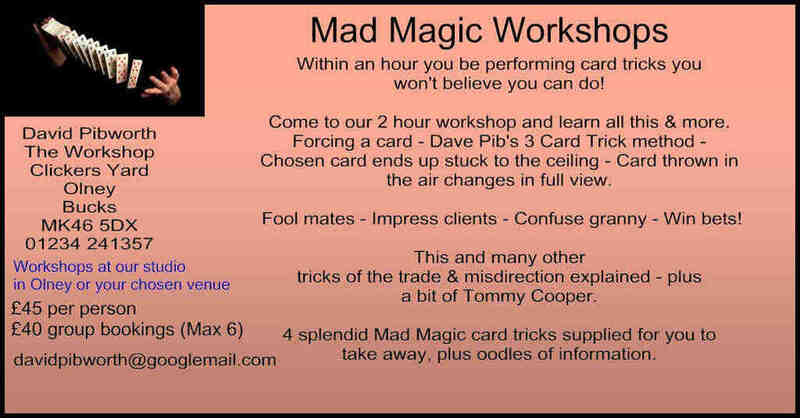 He teaches eccentric magic for The Pauline Quirke Academy and MKTOC also run a youth drama school in Olney from the DPP offices. David maintains his busy lifestyle is a surefire way to avoid being on any committees. He is married to Julie, and they have one daughter, Esther and live in Clifton Reynes, surrounded by dogs, cats and horses. They live so close to the church that David has instructed his daughter - when he dies and not before - to fire him over the wall from a circus cannon. Are you organising an event this year? no unauthorised use, duplication, distribution or modification to any original content contained within this blog is permitted without prior written permission of the author. All other trademarks and registered names are acknowledged.